Teaching Authors--6 Children's Authors Who Also Teach Writing: Fav Poetry Book 2015! 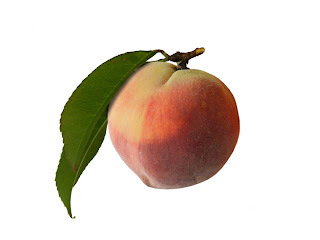 Appreciations for the peach prompt. (I came up with "what's this heavy, soft ball that smells like candy?") I much prefer D.R's flannel p.j. lines! 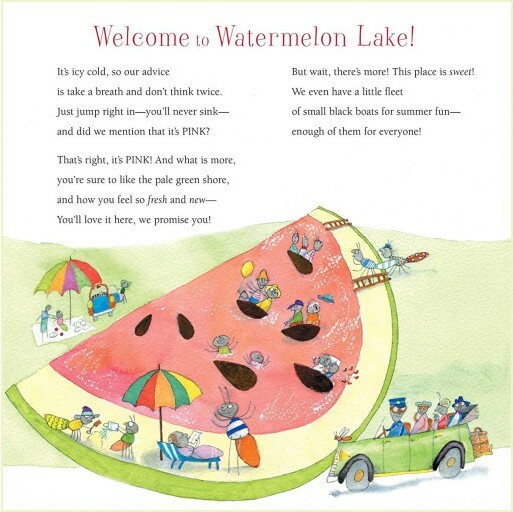 And Joan Rankin's art from this poem & the cover will make kids want to swim & climb & eat their way in. I think I might say I have poem-envy, April. I remember when Jama wrote about this book. 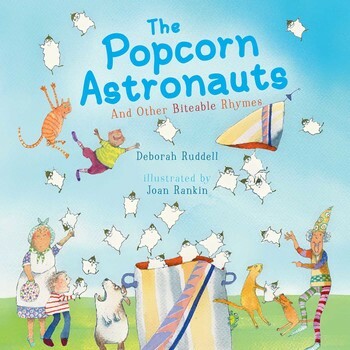 It is so clever, and fun, all the things one wants in a child's poetry book. Thanks for reminding me about it. I need to get it! This is definitely on my want-to-own-it-right-now list! A Whiff of Pine, A Hint of Skunk is one of my favorite poetry books--Popcorn sounds like it will be too. I'm so excited that you picked this as your favorite book! Deborah's ingenuity, imagination and sense of whimsy are awe-inspiring. Hard to believe that she calls herself a slow tormented poet. But it does make me feel better. flannelpajamatyskin is just too cool (and I love that jama is in that word :D.
Ah, great choice, April! Can't wait to read this! Fortunately, my library has this book. Unfortunately, it is checked out right now, but i will read it soon. Thanks for telling me about it. O my, I love the wordplay! What a glorious way to celebrate peaches! I can't wait to read it! Jan ~ yes, yes...Joan Rankin's whimsy (and palette) completes this collection perfectly! Linda B ~ you've hit the nail on the head: Poem Envy! Jama ~ I hadn't noticed your name hiding in that perfect image! Although I know Deborah, I hadn't seen this book yet. Thanks for the recommendation, April. Sounds fab! These are great recommendations for a poetry unit. Last summer I helped teach a writing camp at Grand Valley State University and we focused on poetry for the week. I am excited to incorporate these new ideas into my box of tricks for next year! Thank you! Sabrina Rose ~ I wish I could sit in on your class! Nabanno Nondini ~ stick around long enough,write your deepest feelings and funniest, weirdest thoughts, read about different forms of poetry and imitate them, click on enough Poetry Friday links and..Tah Dah--you'll be on your way!